Below is our review of the Sony Vaio SVE1511L1EW.CEK, a 15.5" laptop, featuring 4GB RAM, 640GB hard drive and Windows 7 Edition Home Premium. Sony are a Japanese manufacturer who are renowned for making quality and reliable electronic products, that often look just that little bit different to their competitor's offerings. 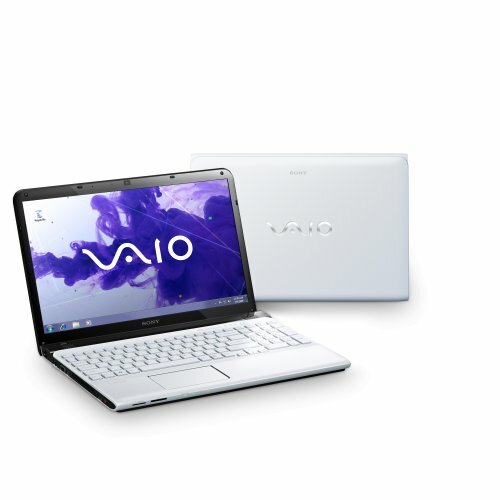 The Vaio SVE1511L1EW.CEK is a perfect example of this - whereas most manufacturers have plumped for understated black and brushed metal finishes, Sony have chosen to case this laptop in a contrasting bright white and black finish. It bears a slight resemblance to some of Apple's offerings, with a striking clean shell; the notebook's corners have rounded off as to make the device look slipstreamed and sleek. The keyboard and controls are decked out in the same white gloss finish, whereas the screen's bezel contrasts in black - and surprisingly it works pretty well; and although it's slightly unorthodox and unusual we all liked the design. The Sony Vaio SVE1511L1EW.CEK comes with a 15.5" screen - and as you'd expect from a manufacturer such as Sony, with their wealth of experience of manufacturing televisions and monitors, the display is crisp, with an excellent picture. As with most laptops, you can personalise this by adjusting the brightness and contrast to suit your preferences and environment. The keyboard is all in white, and spans the width of the laptop - complete with a numerical keypad situated to the right hand side of the keys - a definite bonus if you're a regular spreadsheet user. The keys are evenly spread, with a gap between each one, which should make cleaning easy, and also help avoid typing errors due to accidental key presses. Each key felt solid, and we found them to be reassuringly silent during our test period. Somewhat unorthodox is the location of the touchpad, which is located off centre, to the left of the laptop. This is inline with the centre of the keyboard letter keys, and so it does have a certain degree of symmetry, however it does look a little odd when you first open the laptop. Despite this unusual positioning, the touchpad doesn't feel out of place in use - it responds well to input, and we found it to be both accurate and easy to use. It's fairly generously sized too, so should suit users of all ages and abilities. As with most Sony products, both the keyboard and the touchpad feel well built, and like they were made to last a long time - we can't see any issues here. If you don't get on with the trackpad, then it also has the option to turn off the multi touch facility, and just using the older drag and click style motions to navigate. As with most modern laptops, the Vaio came preloaded with a few software packages, which you may wish to uninstall - McAfee Antivirus in particular may need replacing for another offering from Avast or AVG - but this is simple enough to do. The operating system included is Windows 7 Home Premium edition - we won't pass comment on this simply as whichever laptop you choose in this price range will inevitably have this installed - it's solid and reliable, and we have no issues with it. The initial setup was no problem whatsoever - it picked up our wireless connection straight away, and we were online almost instantaneously. Sony normally have pretty good customer service - so if you did have any issues, we've found them helpful in the past, which is reassuring to know. Also included is the standard Microsoft Office Starter Edition - including a copy of Word and Excel - so no need to puchase these separately. Onto the spec - inside we have the Intel Core i5 Processor, which operates at 2.5GHz. This ran pretty fast, and handled everything we threw at it in terms of graphically intensive applications and HD TV. This laptop features Intel Turbo Boost technology, which is claimed helps to improves processor speed, as and when you require it, such as when using graphically demanding applications. This is backed up by a solid 4GB of RAM, which helps the whole system operate at a pretty fast rate. Storage is catered for by a 640gb hard drive - this is fairly typical for laptops in this price range - it ran fairly silently, and we found no issues here. Further storage can be added by inserting an SD card at the front of the notebook, or by any one of the four USB ports provided. Surprisingly, the sound quality is pretty good for a laptop - years of making a variety of electronic audio products, from the original walkman in the 1980's has given Sony a wealth of experience in this field - and this is reflected in the sound quality of the SVE1511L1EW.CEK. True audiophiles, as with most laptops, may wish to use headphones or an external speaker system, however we found the inbuilt speakers to be as good as we've seen in this price range. Connectivity wise the Vaio includes a generous 4 x USB ports, DVD, an HDMI slot, VGA, ethernet, SD card slot, and separate microphone and headphone jacks - all of this is fairly standard, with the exception of the extra USB port - if you have a lot of devices to plug in then this extra port may swing it for you. Pros: Striking design, decent screen and speakers, solid and reliable. Sony quality. Cons: Slightly higher price than some of it's rivals. So why buy the Sony over one of it's rivals? It is priced at a touch extra than other laptops with an equivalent specification - however you do get that extra peace of mind that comes with a manufacturer like Sony. The notebook has a solid feel to it, and a striking design - it works well, and the speakers and display in particular are excellent. It may cost a little more, but the quality is evident, and you get the sense that it won't let you down. Ultimately whether you purchase the Vaio over another rival's notebook will be down to whether the striking design is to your tastes - if you'd prefer something a touch more understated, then it may well be worth looking at offerings from Samsung. However you can do a lot worse than consider this laptop - it looks good and will last well.